September 9 - St. Peter Claver - USA Memorial - My Catholic Life! It is commonly taught that human rights were born in the Anglo-Saxon Enlightenment of the seventeenth and eighteenth centuries, with nominally Christian intellectuals, including the founders of the United States, midwifing this screaming baby into the modern Western world where he is now an adult. This thesis holds, furthermore, that the recognition of universal human rights arose precisely due to the rejection of Christianity and the hierarchical Church. In other words, human rights were the obverse of traditional Catholicism. As the Church and its archaic teachings receded, the theory goes, the inherent dignity of individual man moved into the light. The problem with this thesis is twofold: first, it ignores one thousand seven hundred years of history, and secondly, most Enlightenment thinkers themselves owned other human beings just like they owned cows, or at least depended on the services of slaves or took advantage of slave women. Today’s saint was among numerous Spanish priests, nuns, and lay men and women who built the Spanish Bridge from the Old World to the New. They knew what Jesus taught. They internalized the content of the papal encyclicals condemning the indignity and immorality of slavery. They battled over human rights in royal courts, they risked life and limb confronting their own unscrupulous countrymen in the fields and ports of New Spain, and they sacrificed their personal health to care for slaves. Their intellectual advocacy for, and practical living out of, human rights is the true source of the Western world’s embrace of human rights, not those few Anglo-Saxon intellectuals whose culture raised them to despise a broader tradition they were ignorant of. A converted former slave owner and fellow Spanish priest named Bartolomé de las Casas laid the intellectual groundwork for people like Peter Claver. Claver practiced, in flesh and blood, what Las Casas had taught a few generations before him. Peter Claver lived human rights. He cared for actual persons at great cost to his own health. He did not write books like Las Casas, or just give lip service to human dignity like many colonists. He implemented Catholic social teaching for over forty years, universalizing the concept of neighbor to include everyone, because everyone is made in God’s image and likeness. He epitomized the love of the Gospel. Saint Peter Claver was from the region around Barcelona, Spain. He joined the Jesuits and requested to serve in the American missions. Like so many saints, when he left for God he left for good. He never returned to friends and family in Spain. He was ordained a priest in the port city of Cartagena, Colombia, in 1615, and immediately and from then on dedicated himself to the physical and spiritual care of African slaves. But he didn’t just care for them in the fields or plantations of Colombia. He met every slave ship he possibly could as soon as it dropped anchor in port. Using interpreters, he greeted the traumatized chained men and women with fresh water, ripe fruit, bandages, perfumes, food, medicine, lemons, and a broad smile and charitable caresses. When weather prohibited seafaring and he didn’t have to be in port, he instructed and baptized whatever slaves were open to it. He baptized more than forty thousand souls. It is said that Saint Peter Claver lost his senses of taste and smell due to his long years of breathing obnoxious odors. He called himself the slave of the slaves. He also labored among the Spanish slave traders, attempting to convert them from their evil ways. When visiting his fellow Spaniards, he did not stay with them but in their slave quarters. This apostle of Cartagena died forgotten, alone, and poor. He was canonized in 1888. 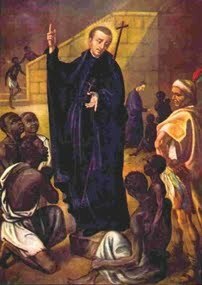 Saint Peter Claver, you worked among the most traumatized and destitute populations of your time, caring for slaves because they were made in the image and likeness of God. Help us to understand, protect, and exalt the inherent dignity of every human person, just like you did. PETER CLAVER was a Spanish Jesuit. In Majorca he fell in with the holy lay-brother Alphonsus Rodriguez, who, having already learned by revelation the saintly career of Peter, became his spiritual guide, foretold to him the labors he would undergo in the Indies, and the throne he would gain in heaven. Ordained priest in New Granada, Peter was sent to Cartagena, the great slave-mart of the West Indies, and there he consecrated himself by vow to the salvation of those ignorant and miserable creatures. For more than forty years he labored in this work. He called himself “the slave of the slaves.” He was their apostle, father, physician, and friend. He fed them, nursed. them with the utmost tenderness in their loathsome diseases, often applying his own lips to their hideous sores. His cloak, which was the constant covering of the naked, though soiled with their filthy ulcers, sent forth a miraculous perfume. His rest after his great labors was in nights of penance and prayer. However tired he might be, when news arrived of a fresh slave-ship, Saint Peter immediately revived, his eyes brightened, and he was at once on board amongst his dear slaves, bringing them comfort for body and soul. A false charge of reiterating Baptism for a while stopped his work. He submitted without a murmur till the calumny was refuted, and then God so blessed his toil that 40,000 negroes were baptized before he went to his reward, in 1654. Reflection.—When you see any one standing in need of your assistance, either for body or soul, do not ask yourself why some one else did not help him, but think to yourself that you have found a treasure.